The McCurry herd originated when Walter McCurry purchased two Angus heifers from his brother-in-law Johnson Workman in 1928. (On page 5 is a reprint of the Johnson Workman advertisement from the 50th Golden Anniversary Edition Aberdeen-Angus Journal.) Johnson Workman was a pioneer in agriculture and the Angus breed. Many cattle today can trace their roots back to his herd established in 1913. His program descended from the very first Angus cattle imported from the original birthplace of Angus cattle Scotland, to the United States of America to Victoria, Kansas, by the legendary George Grant. The story of how Walter came to Kansas is straight out of a wild-west adventure novel. Growing up in Tennessee, Walter was orphaned at an early age. His mother died when he was 3 years old and his father was shot and killed when he was 12. After living with an uncle for one year, he ran away by boarding a train headed for Geneseo, Kansas with 25 cents in his pocket. There, Walter eventually met and married Cora Workman. They farmed in the Geneseo area until the early 1930s. The couple then moved their six children (daughter Oda Lee; sons A.J., Dale, O’dell, Bob and Cecil) to south central Kansas, north of the Arkansas River, in northwest Sedgwick County in 1934. Walter and Cora knew water was paramount to a successful farming operation so they settled on land with plenty of it. When they applied for a loan at the local bank in Mt. Hope the banker told them, “Looks like a good place to starve those six kids.” Walter knew better. 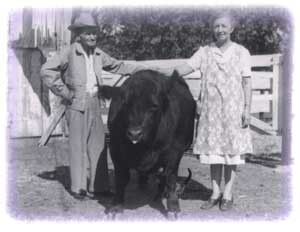 Throughout the 30s, 40s and early 50s the family farmed and raised Angus cattle. Walter was very active in the local 4-H program and other youth activities, and also a very progressive and determined man. He was a founding member of the drainage district, a huge project at the time that has helped drain the flat country where they lived. He served many organizations and firmly believed it was his duty to give back to his community. Denied an education because of his childhood circumstances, Walter received his 8th grade diploma in 1912 at age 21. Walter McCurry dispersed his cow herd in 1956. In 1958 the five brothers formed a partnership. In those days, the herd consisted of 100 registered cows and one section of farmland. One herd sire was Prince Eric of Red Gate 3. He was bred in the Red Gate herd at Millwood, Virginia and sired by the imported Prince of Rowley. Prince Eric of Red Gate 3 proved to be a great sire in the McCurry program. Also used was Homeplace Eileenmere 497. He was bred in the Penny and James, Homeplace herd in Hamilton, Missouri sired by Eileenmere 687 who was the son of Eileenmere 487. Another outstanding bull used in their program was Elite 269 of Angus Valley. 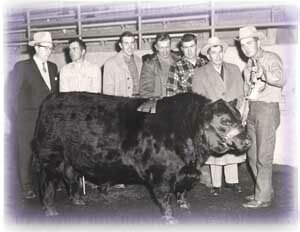 He was sired by Elite of Tofts, bred in the Angus Valley herd at Tulsa, Oklahoma. He dispersed the herd in 1956. But the Sedgwicks prefix, which he made prominent, was retained when his sons all returned from military service and created the formal partnership. In those days, the herd consisted of 100 registered cows and one section of farmland. The herd sires were Prince Eric of Redgate 3 and Homeplace Eileenmere 687. Walter got a glimpse of the future in the 1950s as his sons expanded their herd and exhibited cattle at the shows and sales around the state. The work ethic and integrity he demanded of his boys was paying off and he derived a great deal of satisfaction seeing them work together. Walter McCurry passed away in 1962 from a chronic lung condition caused by inhaling mustard gas during the war. cora lived at the homeplace and was the heart and soul of the operation until her death in 1979. Each brother was suited to a different task. AJ was in charge of alfalfa production and maintenance, O’Dell the row crop, Bob wheat farming and show cattle, Dale (1967 President of the Kansas Angus Association) the cow herd, and Cecil (1988 President of the Kansas Angus Association and a member of the Board of Directors for the American Angus Association for six years) operated the grain elevator and took care of the books. 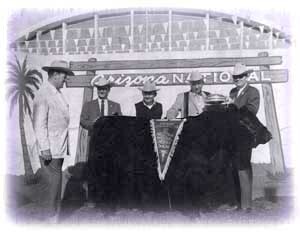 Five McCurry Brothers were inducted into the honorary membership of the Kansas Angus Association in 1999. The McCurry Bros. elevator was purchased in 1962 and developed over the years into a thriving business offering mixed feed, fertilizer, jobs and a place to loaf for three generations of Mt. Hope area farmers. In 2000, Cecil and his brothers sold the elevator to the Halstead CO-OP. The McCurrys kept some acreage and the large shop east of the elevator and remodeled it. Like most family outfits operating today, many things have changed, but the family values and faith in our way of life remain. Today’s enterprise consists of 500 registered Angus cows, 3,000 acres of grass, 3,000 acres of irrigated cropland, and 2,000 acres of dryland farming. There are 10 full time employees, 9 of which are Mccurrys. A new partnership has been formed with Barry, geoff, Brad and greg as managing partners. Each of these men has worked an average of 30 years at the farm and ranch and bring a lifetime of experience to the table. Greg was president of the Kansas Angus Association in 1994. 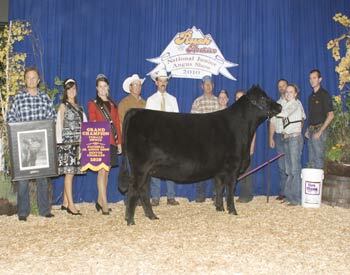 Sedgwicks Erica U332 won grand champion owned female at the 2010 National Junior Angus Show (NJAS), July 11-17 in Denver, Colo. Cashley Ahlberg, Longmont, Colo., owns the October 2008 daughter of B C Lookout 7024. She first won senior champion. Please pay us a visit whenever you are in our area! More stories about our proud history can be read here. Copyright © 2001 Angus Productions Inc.